TET (Ivan Attitude x Don't Touch This) Sev. 27" scapes, 6" flowers, 3 way branching with 24 buds.If you are looking for truly clean colors IMA BIGTIMER is it. 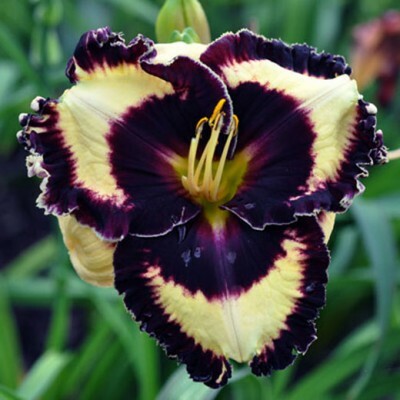 This flower has one of the closest to white backgrounds, which make the eye and very large ruffled edge almost a bright black. One may wonder how that can be. When you have flowers with as close as possible to a white base that will allow the other colors to be seen as their true color. As a parent, IMA BIGTIMER is proving itself to be superior, throwing the cleanest color combinations with WHITE backgrounds that I have ever seen. A bright beam in the garden. Fertile both ways. Reblooms! Very limited.